Need help? Click here to download a tutorial. Noble Elementary School's family fun festival on the playground. Carnival games, bake sale, “pop walk,” bike registration, Cleveland Heights Library Book Mobile, BOGO (Buy one, Get One FREE) Book Fair, bounce houses, food trucks, a children’s poster contest to decorate the school and the play ground, Montevista and Ardoon will be closed to allow kids to ride bikes around for fun. Can you volunteer for an hour or two? If so, click here to let the organizers know! Noble Rd. Presbyterian Church, 2780 Noble, is hosting Urban Line Dance from 7-10 PM downstairs in the Fellowship Hall. Everyone is invited to join in for a fun time! Admission is $2. The line dance instructor is Marcelo Atanasio. Church of the Master, 4050 Monticello, is hosting a FREE movie night. War Room, a film about the power of prayer, is the feature film this evening. Start Right Church, 977 Caledonia, is selling a large inventory of home renovation materials left over from previous projects - exterior doors, storm doors, interior doors, windows, tile, flooring materials and more. Great deals are here! Disciples Christian Church, 3663 Mayfield, is hosting a day of neighborhood fun! Bounce house, live music, tall puppets, face painting, accessories and plant sale, food and bake sale. 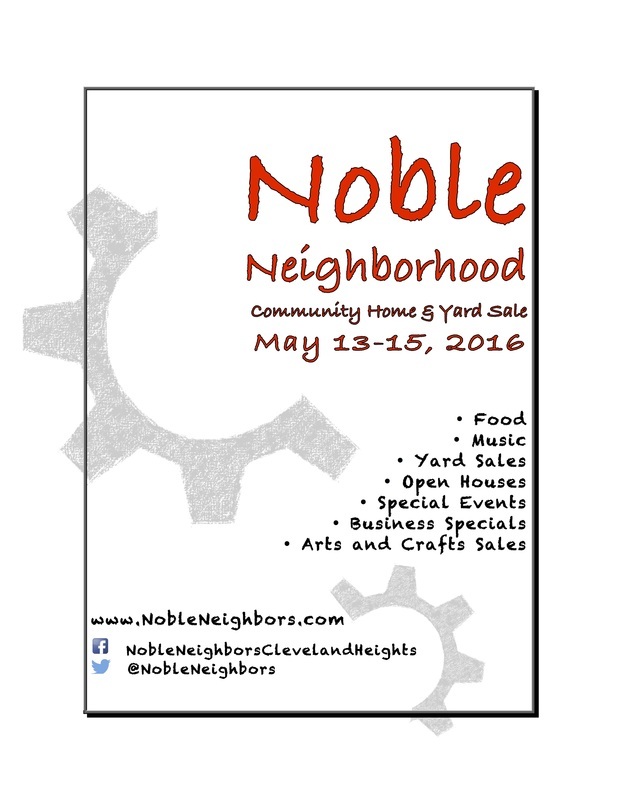 Noble Road Presbyterian Church, 2780 Noble: Bake sale, plant sale, and a children’s craft activity. Home Repair Resource Center, 2520 Noble Road (corner of Oxford and Noble), will sell used tools: large power tools (band saw, jointer, table saw), small power tools (corded and cordless), assorted hand tools, concrete tools, lawn tools (power and hand), paint, accessories (tool boxes, tool pouches), nails and fasteners. All tools are sold “as-is” and they’re all priced to MOVE! Do you have tools you want to donate? Contact us by Wednesday, May 11, and we’ll talk. Call Wes Walker, 216.381.6100, ext 22 or email wwalker@hrrc-ch.org to see if we can use your donation. Quarry Road entrance. The park is on the Monticello and Belvoir corner. We will offer free hot dogs at the Denison picnic shelter. Jim Miller will set up a table and offer information on Quilliams Creek and Nine Mile Creek. Rob Fisher and several Boy Scouts will assist with activities. Learn about the opportunities that the city's recreation department offers! Youth Soccer will be ongoing, as will basketball activities. Come and learn what else Cleveland Heights Recreation offers! Bethel Church, 2706 Noble Road, Bethel will host a BBQ, yard sale, bake sale, bathroom facilities and parking. The Police Academy, Noble at Monticello, housed in an old-time fire station, will be open to visitors. Look for K-9 Officer Argos, the bike unit, students of the police academy, and representatives of the Citizens Police Academy alumni. The academy will also be open so people can come in and look around. The Rocket Car, one of the former Euclid Beach Park rides turned into a motor vehicle, will launch from Oxford School for rides around the neighborhood.​ Sponsored by the real estate agents who are showing properties in the neighborhood this weekend. Thank you! Take a some time to tour this garden, established early last century, and learn about the Permaculture Demonstration gardens. Look for their table at the the Oxford Carnival! The Friends of the Library are sponsoring a book sale. Library staff will host activities for kids! Church of the Master, Monticello Blvd, will host an ice cream social! Also piano recitals will be presented by the students of Modern Day Piano, instructor Linda Harris, inside the church beginning at 3:30. Look for food, music and sidewalk sales at Academy Music, Christopher's Pub, AV Remodeling, Fabulous Finds, Moran's Bistro and Lil Bill's Snack Shop. Also participating are: Faith Lee Ladies Clothing Boutique, La'Sheek, Boost Mobile, Flawless and Fierce Hair Creations, Premier Barber Shop, Hilltop Lounge, Alice's International Salon and Taste and See. Woodview Hope Garden, 930 Woodview, was established to feed people fresh food by donating their produce to the Heights Emergency Food Center. Learn more about this well designed garden and bee hives, and how to volunteer and support it by finding them on Facebook. Stop by and visit! Who knew that scheduling a mid-May event would include navigating hail and snow thunder? Resilient and resourceful, everyone adjusted to host indoor, or at least covered events. Check out the yard sale photos in this next slide show. You'll see how much hail we had that morning! Wonderfully, the afternoon brought brighter and warmer weather. That's evident in other photos of the day. StraightWay Bible Fellowship, 2392 Noble Rd, in the building behind Mount Olivet Lutheran Church, is hosting an "Operation Andrew" service, at 11am, on Sunday, the 15th. We encourage those who know of someone who is seeking to invite them to this special service. FIREPLACE INSIDE! BOMB SQUAD DEMOS OUTSIDE! The Police Academy, Noble at Monticello, housed in an old-time fire station, will be open to visitors. Look for K-9 Officer VIn, bike unit, police academy and citizen alumni representatives, along with the Bomb Squad. Stop by, look around, meet the officers, and view our bomb equipment! Bethel Church, 2706 Noble, is hosting a variety of live music on their front porch. Enjoy free popcorn and baked goods as you're browsing their rummage. The Rocket Car, one of the former Euclid Beach Park rides turned into a motor vehicle, will launch from Bethel Church for rides around the neighborhood.​ Sponsored by the real estate agents who are showing properties in the neighborhood this weekend. Thank you! Realtors will hold open houses all over the neighborhood. This is the time to buy a house here! 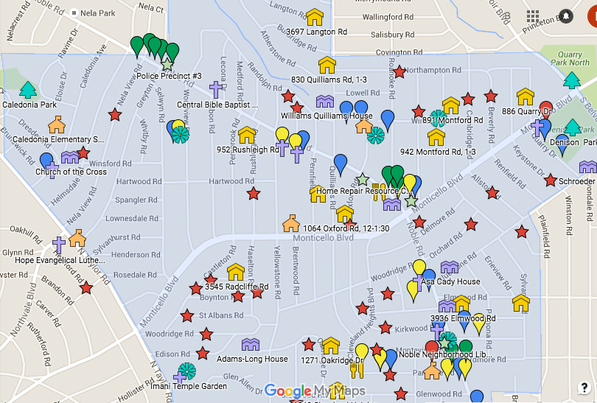 Prices are great and the neighborhood is on the upswing! Woodview Hope Garden was established to feed people fresh food by donating their produce to the Heights Emergency Food Center. Learn more this well designed garden and bee hives, and how to volunteer and support it by finding them on Facebook. Printable Map - click on the map below to download and print.